It’s no secret that the internet runs on content. And content is the main pillar of the email newsletter business. Just look at one of my businesses as an example. We’ve been active in the gardening niche since 1999 and at the time I’m writing this we have well over 1,000 pieces of content online. We have articles, videos, blog posts, and more. Each piece working like a little 24/7 salesperson for us. It’s taken us many, many years to create all of that. But we didn’t first create all of that content to drive traffic to our sites and to get people onto our list. We didn’t set out from the beginning, back in 1999, and write/record 1,000 different pieces of content with the intention of using each piece as a traffic generator. Nope. We created that content, one piece at a time, for our subscribers. Read that last sentence again because it’s imperative that you understand this. We did not sit down and crank out 1,000 pieces of content before launching our business. My Dad built it just like I show you how to do in this training. He started with a simple squeeze page giving away one little eBook called The Gardener’s Secret Handbook. The same eBook we’re still giving away to this day (I’ve since added a number of other freebies to the offer though). Each piece of content was created over time to use as a newsletter that we could email to our subscribers. The byproduct of doing that is, now we have all of that content to use everywhere online. That’s a big lesson right there. Don’t write content for the search engines. Write it for your subscribers. If your subscribers love it, the search engines will love it too. That’s how the SEO game works. It’s how it’s worked for us since 1999. We don’t ever have to go back to tweak old pieces of content after an algorithm update. Because all the search engines really care about is that the content they rank is useful to the reader. Period. So you’re probably wondering how my Dad generated traffic to his squeeze page back in 1999. I only share that with Newsletter Academy members. I’ve looked back at our massive archive of email newsletters and divided them into three different categories of content creation. Each of these three categories appeals to different types of people so I can bet one of these three will be more appealing than the other two to you. This strategy actually includes two different types of content creation. 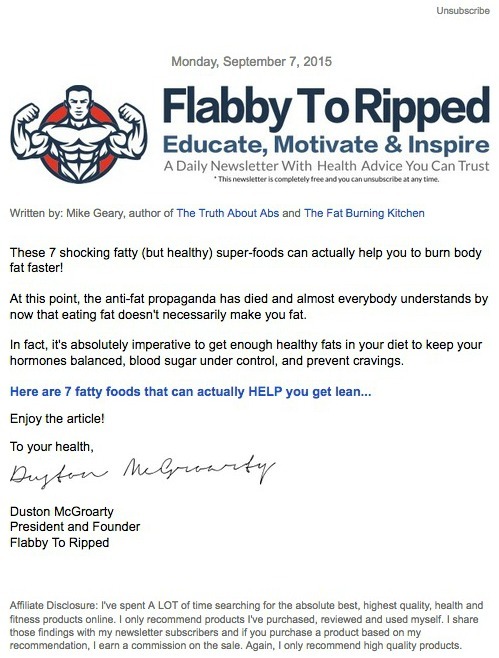 If you like to write and research, then create your newsletters yourself. You can also use private label rights (PLR) products if you don’t plan on putting your newsletters online. If you want to put them online after you’ve emailed them, I don’t suggest using PLR since it’s likely other marketers have already put the same info on their sites. The second type of content creation for the DIY Strategy is to actually outsource the writing and research to someone else. In the past, I’ve used iWriter for this. For $3 you can get a really well-written 500-word piece of content, so long as you hold the writers to good standards. Don’t be afraid to request rewrites and even reject pieces from authors who submit “crap” and expect you to accept it. You only pay if you’re happy with the end result. The beauty of using iWriter is you get these pieces written really fast. I’ve had as many as 60 pieces, 500 words each, written in less than one day. Think of them as an investment in your business. Pieces I’ve outsourced in the past are still ranked on page 1 of Google too. Go to Google and search “how to keep squirrels away”. You’ll find an article on MikesBackyardNursery.com. That article cost me $22.63 and is 1,015 words long. I posted it on MikesBackyardNursery.com on August 27, 2013. It took about two months for it to move up to the first page of Google but it’s stayed there ever since. It’s now attracted 130,494 new visitors to our website since the day I posted it. Google Analytics screenshot showing number of new visitors from the How to Keep Squirrels Away article. In 2017 alone, that one little thousand-word article brought us 50,943 new visitors to our website. That’s fifty thousand visitors for twenty-two dollars and sixty-three cents. Like I said, you have to be very specific when you submit these jobs to writers. Tell them exactly what you want and hold them to it. If you’re wondering why outsourcing is part of the DIY Strategy, it’ll make more sense after you read the other two strategies. Now, in the above example, I didn’t actually include the content from the article inside the email. I made them click the link to go read the article on our website. Again, this is a seasonal business and I basically send the same content out around the same time every year. So, once it’s posted on one of our sites, I usually send people to the site to read it because our sites include ads all over them for products we sell. However, when we first started out, all of the content was included right inside the email. And I still do it that way sometimes. This strategy is more about publishing other people’s content than your own. It’s not the best choice if you’re looking to use your content online for SEO purposes too. You’re really just taking content that’s already written, including it in your email newsletter, and giving the source proper credit according to their requests. Many marketers aren’t aware of the following content licensing websites: Constant Content, Creators, NewsCred. The above sites are in order from least expensive to most expensive with NewsCred being in the thousands of dollars per month range. Constant Content is pretty cool though. Some of the writers allow you to purchase one-time usage rights which are cheaper than buying the full rights to each piece. And the quality of writer is higher than services like TextBroker. I’m not knocking TextBroker though. I outsource pieces from them every month. But the TextBroker writers are typically “freelance beginners” just looking to make a little extra money on the side. From what I’ve seen on Constant Content, these are professionals looking to get more money from their work. This is the third and final strategy and probably one of the coolest because it allows you to get quick content that other people create but also offers the SEO benefits that the DIY Strategy offers. Curating content is not new by any stretch of the imagination. But most marketers rarely use it because they’re afraid. Afraid of having duplicate content. Afraid of not being original. Afraid of stealing. I’m not a lawyer so don’t take this as legal advice. All I can do is share what we’ve done and what others have done. You’ll have to make your own business decisions for yourself. Study the viral sites like Upworthy, ViralNova, and BuzzFeed. All three of those sites got their start using nothing but curated content. You might argue that these would be difficult to include inside of an email. Yes, difficult… but not impossible. I’ve sent some really long emails before. Like, really long. Just be sure you always credit the sources of the content you’re using. If they have a problem with you sharing their content, they’ll let you know, and you won’t be able to use it anymore. In the newsletter above, I used a mixture of content from other websites, other Facebook pages, and a few of our own pieces… as well as ads for our own products. You can see how quick and easy this could be to create for your niche though if you just found a few interesting articles to link out to, a useful and interesting Youtube video, maybe a funny meme or something, and then a few ads for Clickbank products or other affiliate products. To finish up this module, I want to leave you with some tips on how to generate an unlimited number of content ideas for your newsletter. One of my favorite tips is to look at magazine covers from your niche. 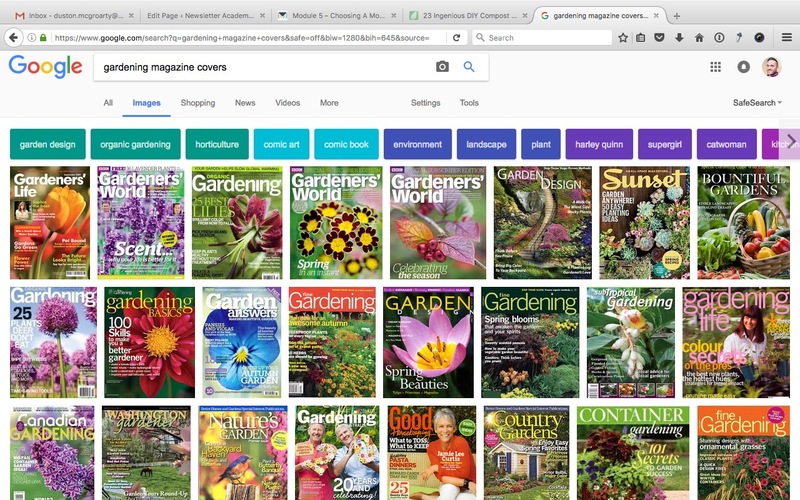 Just go to Google and type in “your niche” + magazine covers. And that’s just a few from the very first row! Now, I’m not saying to blatantly copy their headlines word-for-word but they’re a great head start. A few other tools you can use for content research are the Google Keyword Planner, BuzzSumo, and SumoRank. They’re great tools to show you what’s popular, what’s been shared the most, and what’s doing well on social media properties. That’s really all I do to as far as generating content and content ideas goes. Yo, Duston! This is out of topic. When did you exactly start your online marketing journey? 1999? But in another article you said 2010? Thank you, Duston! Personally, I started in 2010 when my Dad asked me to move back to Ohio and take over the internet side of his business. My Dad started our gardening site(s) back in 1999.